SALT LAKE CITY (CNS) — Archbishop Joseph E. Kurtz, president of the U.S. Conference of Catholic Bishops, and leaders of the Church of Jesus Christ of Latter-day Saints met May 4 to discuss matters of common concern and to strengthen relationships between the two churches. The archbishop, who heads the Archdiocese of Louisville, Kentucky, was in Salt Lake City at the invitation of the LDS church leaders. 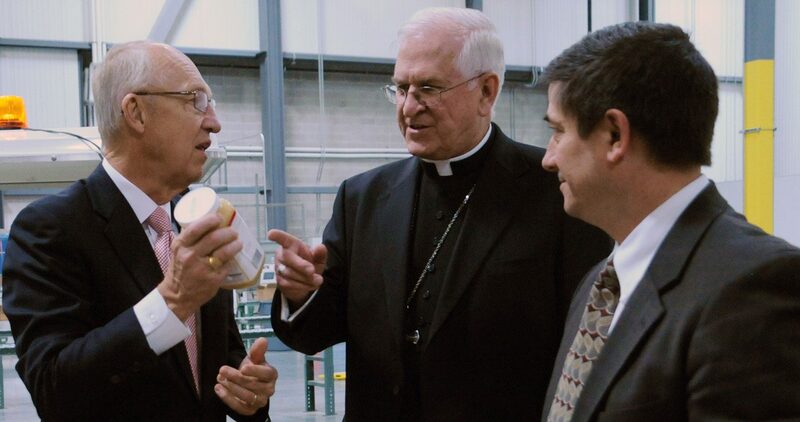 While in Utah, Archbishop Kurtz met with the Quorum of the Twelve Apostles, the Presidency of the Seventy, and the Presiding Bishopric, and toured the Utah Bishops’ Central Storehouse and Humanitarian Center, which are both in Salt Lake City. The visit was not only a continuation of an existing dialogue between the two churches but also an opportunity to renew friendships with people he has met through efforts such as Faith Counts, the archbishop told the Intermountain Catholic, newspaper of the Salt Lake City Diocese. The ecumenical Faith Counts is a nonprofit that includes the USCCB, the LDS church, the Seventh-day Adventist Church, Hillel International and the Sikh American Legal Defense and Education Fund, among others, to promote faith values. In the past year, the LDS church has invited several other Catholic officials to Utah, including Archbishop Charles J. Chaput of Philadelphia and Archbishop Bernardito Auza, who heads the Vatican’s permanent observer mission to the U.N. The late Cardinal Francis George of Chicago spoke on religious freedom at Brigham Young University in 2010, and in the past the Salt Lake City’s Catholic bishop has worked with the LDS church on various efforts of mutual concern both locally and nationally. LDS leaders also have addressed Catholic audiences. In 2014, President Henry B. Eyring of the First Presidency spoke at a Vatican summit on marriage and met Pope Francis, and one of the speakers at last year’s World Meeting of Families in Philadelphia was Elder D. Todd Christofferson of the Quorum of the Twelve Apostles (see CatholicPhilly.com’s coverage of his session here). How encouraging to read about the Catholic Church in dialogue with The Mormon Church and to realize how much we have in common!